South facing exceptional property overlooking the Luberon, with outbuildings, on 9,5 hectares. This former shepherds stone house, dating from the XVIIIth century, has been renovated and extended into a very comfortable dwelling of a usable surface of approximately 450 sqm. A hallway upstairs, on the north side, leads to a cloakroom and guest toilet, the master suite (bedroom I, bathroom, walk-in wardrobe and study), then a wide staircase that goes down to the large living room. In a row are the eat-in kitchen with a scullery, a formal dining room with stunning stone fireplace, and a TV lounge in the oldest part of the house. All the rooms on the ground floor open onto a south facing shaded terrace by oaks trees. A second staircase leads upstairs to beautiful bedrooms II and III as well as a bathroom + shower. On the east side, a beautiful wooden terrace is shaded by sails. Possibility of 2 additional bedrooms. To the west, a spacious pool house (awning, summer kitchen, shower and storage) with large terraces and sails also. Slightly lower down, a 20 x 4.5 meter heated infinity pool overlooking the valley. To the rear, a porch connects the farmhouse to a building with 2 large garages and an office. A few meters to the north, a wide awning allows for parking 6 vehicles in the shade. The beautifully landscaped garden represents about 2 hectares of lawns, lavenders, cypress trees, oak trees, etc around the house, and is surrounded by about 7 hectares of vineyards, cherry trees, truffle oaks and olive trees. 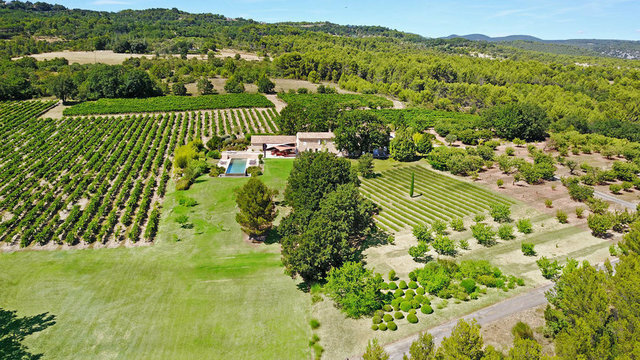 The whole plot of land is gently sloping towards the south, with valleys on either side and benefiting from breathtaking views over the valley to the Luberon.